What is Judaism all about? Welcome to the Institute for Conversion and Outreach Education ( ICOE) of the New Jersey Region of the Rabbinical Assembly, in conjunction with United Synagogue of Conservative Judaism Mid- Atlantic District. Our program is a great beginning for Jews and non-Jews who are looking to learn more about Jewish traditions, values, culture, and spirituality. 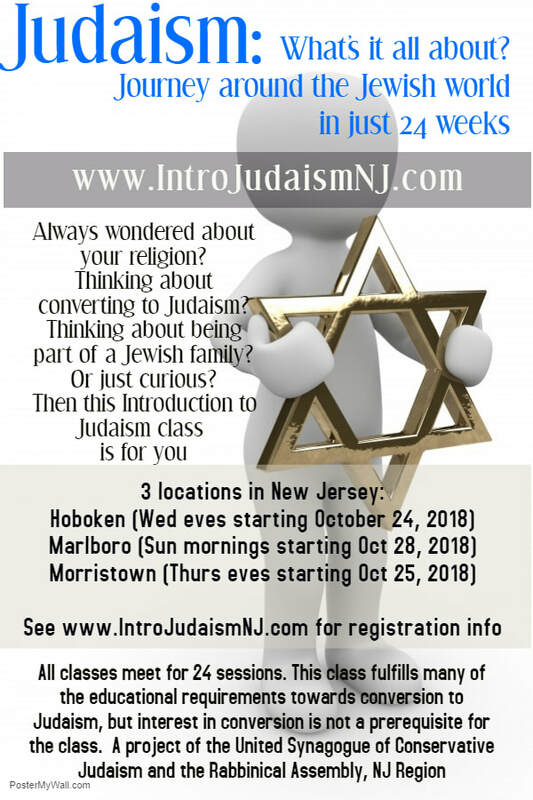 On this website, you can learn about our Introduction to Judaism course, which meets for 24 sessions in four locations throughout New Jersey, as well as our shorter, 3-5-session Explore Judaism classes, offered in synagogues throughout the state. Click here for the online registration form for 2018-19, or see below for a pdf version of the registration form. A project of the United Synagogue of Conservative Judaism and the Rabbinical Assembly, New Jersey Region.